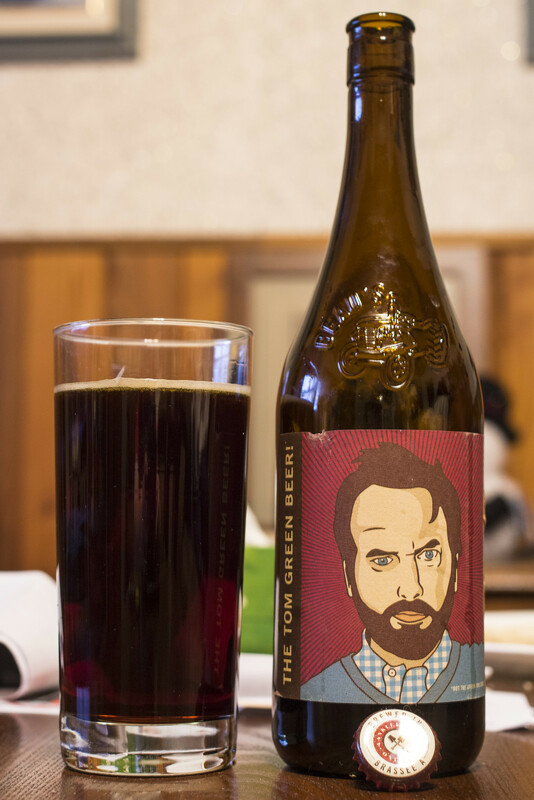 Beau's and comedian Tom Green teamed up a few years back to create a Tom Green beer, a milk stout that tops out at 5%. Knowing Tom Green's humour from the 90s, I expected a really weird what the hell?! kind of beer but nope.. a straight forward milk stout! Not only that, it gets rave reviews from many of my friends out east! Appearance: The Tom Green Beer pours a sorta heavy brown stout, nowhere near as thick and heavy as your typical stout or porter for the fact that I could see a bit of light through the beer easily. A bit of a burnt caramel hue, a very liberal amount of fizzy carbonation which was a surprise as I was expecting it to be more of a thick, creamy appearance. Minimal cookie dough yellow head that only goes to the side of the glass for the entire time the beer is in the glass. Aroma: I'm noticing notes of roasted maltiness giving off a roasted coffee aroma with liberally sweet caramel, a hint of a herbal aroma that's reminiscent to green tea, definite notes of milk in there but it's fairly light, light graininess from the barley. Taste: It's a sweet, slightly creamy milk stout with herbal tea notes starting out front followed by a moderate roasted coffee bean flavour, earthy hops - the herbal notes likely link back to the hops itself, hint of burnt syrup, it's fairly watery for mouth feel and leaves a bit of a bitter/metallic aftertaste. Overall Thoughts: An interesting milk stout but I was hoping the lactic side of the stout would have been more prolific like in Charlevoix's La Vache Folle but it is certainly perfect for the long winter nights right before bed. The herbal notes are what surprised me the most, but I love when something interesting pops up like that!